Columbus is in the hunt for the playoffs and they never have been before. Rick Nash scored the first unassisted Hat Trick since Maurice Richard in their 8-2 win against Detroit. He is a stud. The team name comes from Ohio's proud Civil War heritage. 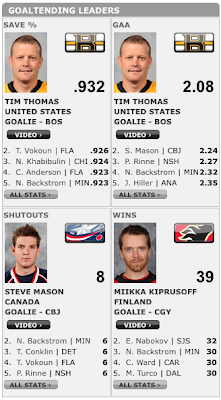 Thomas and Steve Mason both play, so only this season's wins leader won't be a statistic led by a goalie in the game. In case you hadn't heard, Wheeler sat out on Saturday. This is the last Western Conference road trip game of the regular season. The Sky is Officially Falling over at Here Come the Bruins!. Not without reason. Been a while since I've done this, it feels like. I've been busy. Stanley Cup Of Chowder: Great Picture! "Over the last 5 games, the Bruins' PK has only killed off 61.1% of penalties. Columbus is ranked last in the NHL on the power play (12.8%)"
HubHockey: "But was the team to blame or just one player? Of course the coaches and team as a whole wont point the finger, but I will. MANNY FERNANDEZ!" He's right, of course, but one game does not a season make. The Bear Cave: "Despite only playing each other seven times, shutouts have been rather common in this series, as three of Boston's four wins have come via a blanking. Two of those shutouts have come in Columbus, where the Bruins and Blue Jackets have split their four meetings. Meanwhile, both of Columbus' wins on home ice have come in overtime." Matt Kalman: "Against the East, Mason has been almost unbeatable - with a 9-1-0 record, 0.99 GAA and .964 save percentage." NESN First Shift: "Patrice Bergeron is riding a five-game points streak with a goal and five assists during that span. Bergeron now has 31 points. Chuck Kobasew scored against the Rangers on Sunday and now has a three-game points streak. Kobasew has 33 points." The Bruins' Magic Number is 12.
come on Bruins, you guys can afford to drop the 'jackets' game, eh, Pierre?